Right-wingers, republicans, people like Paul Ryan, Ron Paul and others, all advocate a society which in reality would lead to a more corporate-run society. They want to privatize more services and give HUGE tax cuts to the wealthy and the huge corporations. And then they claim that their policies would lead to more freedom. Well, they’re way off. The non-elected financial elite - the wealthy and the huge corporations - getting more power over the economy and our workplaces has nothing to do with freedom in my opinion. The financial elite will get more freedom, that’s true, but they’ll get it on the expense of others. The workers, the students, the senior citizens - most of the population in fact - will get their freedoms infringed because of these policies. Right to participate in your community. Right to control your own life and workplace. Right to have a democratic say in the things that affect you. Right to basic necessities in order to have a decent life, like free health care, education, healthy nutrition, and a decent home etc. True freedom is one that does not infringe the freedom of others. Thanks :) Glad to hear. So you're a libertarian socialist, I take it? I don't like labels because I tend to like a mixture of things and I don't like to cling to any particular dogma, but yes, I do like a lot about libertarian socialism. Sure, but Libertarian Socialism is basically advocating freedom for individuals to control their own lives. Labeling yourself as a libertarian socialist means that you label yourself as one who wants freedom and solidarity. I don't think we should be too afraid of labels - as long as they're the right ones. LS also consists of several philosopies with very similar, but somewhat different suggestions to organization of society. Okay. I'll think about it some more. NC explaining the basics of Libertarian Socialism. Abolish The Federal Reserve, I.R.S., The Forest Service, cancel the public and private debt, Fake Money= Fake Debt..
No, that's the wrong approach. The real problem is this enormous concentration of private wealth and power that has increased substantially the last decades. This "end the fed and IRS" stuff comming from these ultra right-wing libertarians is just nonsense. In the US it is private power that's the main problem, not government. the huge problem of private wealth has a lot to do with bogus tax codes that benefit the 1%, the federal reserve propping up banks and big corps allowing them to pay fat CEO bonuses and fund 1% policies that assist in large concentrations of wealth. We could have a monetary policy based on introducing money into the economy through job creation and loans directly to the people at .01% interest instead of people losing their houses to fraudulent bank mortgages while building up debts with high interest rates which steal their money over time. and yes private power is a huge problem. outsourcing jobs... exploiting workers... violating labor laws.... underpaid salaries.... the list goes on for sure. but you also have to realize that in one year the Federal reserve gave a trillion dollars to bank of america. What could your state do to make it better for the people with a trillion dollars? Think Dennis Kucinich and Alan Grayson when it comes to Fed talks. Claiming it's right wing rhetoric is ignorant. HR 2990! We need GROWTH! The Fed-guys are definitely no angels, no. Lots need to be changed in many different areas, this included. What I'm saying is that these ultra righ twing/Ron Paul policies is the wrong approach. Private power buys government people and the courts too.ultra right wing libertarians ,is that the best you can do? The Fed, has printed 50 trillion dollars,backed by no goods and services,Thats counterfeiting on a mad scale.. And you condone this behavior? "Private power buys government people and the courts too"
"ultra right wing libertarians ,is that the best you can do?" What, wasn't it not good enough? What's your suggestion, then? "The Fed, has printed 50 trillion dollars,backed by no goods and services,Thats counterfeiting on a mad scale.. And you condone this behavior?" I never said that the Fed-guys are angels. What I'm saying is that this shouldn't be the main focus. It's the concentration of private wealth and power that is the main problem. You should advocate higher taxes on the rich, not ending the fed. why no let the U.S.Treasury priInt their own money backed with something of value,like gold .. Why not confiscate the assets of all the criminal corporate and government agents and give it to the people..
Citizens Audit Committee, Citizens Arrest Committee, Citizens Court, Citizens Body Politic, We've outgrown the Corptocracy, We can do this.. We have more than enough evidence to convict the traitors..Address corruption before society can move forward..50 trillion dollars and no one noticed?Where did the money go?Why is Bernake still walking the streets?He needs to be paraded down mainstreet,along with all the other Libor Criminals,bribed officials,collusionist,obstructionists,Exortionists, take their assets and give it to the people..
We have lots of evidence of the plutocratic rule and undermining of democracy, but to fight it effectively this movement must grow large. Organize communities, workers etcetc; then when big enough, lots of options will be available. There's no way to resolve the(se) arguments about freedom until the basic issue of "the End of Growth" is addressed. Any notion of freedom can't be resolved until this basic turning point is acknowledged -- a critical turning point for a civilization where the individual can no longer avoid the whole. And as far as basic necessities, they are things like food-of-the-earth, air, waste elimination, sleep, and socialization. Everything else is a "value-added" by another human being who may not have any obligation to you, particularly for the work he/she has added. the Romney/Ryan ticket budget plan adds 2.6 trillion to the debt. How relevant is this to my post, exactly? just another fun fact to prove that point! "true freedom is posting whatever I want in the comment sections. lol"
Post whatever you want dude. Your right to "freedom" includes my right to be free from you. Your "right" to free health care, education, home, etc. imposes on others by demanding things without payment. That's where your argument breaks down. You are not owed anything by anyone. People don't work for free and you don't have a right to their labor, property or services without payment. "True freedom is one that does not infringe the freedom of others." When you demand things without payment because you feel it's a "right", you ARE infringing on others. "Your right to "freedom" includes my right to be free from you." This has no root in reality. The economy is all-encompassing. We live in a complex, highly developed, technological society with all kinds of endless networks of economic relations, decisions, transactions etc, that affect the economy we're all a part of in all kinds of different ways. There are different kinds of “affairs”; some that only affect you, and the ones that affect others. What you do in your personal life; which color you decide to use when you paint the walls in your living room, or what you do in the bedroom etc, things that don’t affect other people, that’s totally up to you, and is your decision alone. On the other hand, if you choose to make decisions that affect other people in your community or the national economy, for example by being in control of a huge corporation that’s a big part of the economy, and is the workplace of lots of people, well then that’s something completely different. If you make decisions that affect other people, well then you have to expect that the ones affected will intervene in these affairs. Well, creating solidaric communes and co-ops etc, is an important task that should be prioritized, but the argument above does not hold up. Again, the economy is all-encompassing; a couple of anarchist communes or co-ops here and there doesn’t change the fact that the super-wealthy financial elite have the overwhelming power in society. When it comes to the economy we’re not, as individuals, living in an isolated bubble of some kind, just “minding our own business”. On the contrary; when it comes to the economy we’re all in the same boat. The economy is all-encompassing and affects us all. "Your "right" to free health care, education, home, etc. imposes on others by demanding things without payment." We have more wealth than ever. We can afford it. But first we need to redistribute the wealth. If we create a free, egalitarian classless society in which people are in control of their own lives, we can make sure everyone can have a decent life. "That's where your argument breaks down. You are not owed anything by anyone." We live in a wealthy highly advanced society built up by genrations of people. We live in a free ride society. You're not making any sense. "True freedom is one that does not infringe the freedom of others." None of your views have ever stood the test of time. If people aren't allowed to own their own property and labor (in other words they're slaves to your image of community), then they walk away mentally. In other words, they outsource and expatriate. Free people are not going to buckle to your view of a utopia (iron-fisted top-down authoritarian redistribution by central planning). Capitalism has created higher standards of living and a freer happier people than socialism, crony-capitalism or statism ever could. That's a fact. Yes, we live in a free ride society. I'm advocating for that to stop and it starts right at all the OWS complainers who expect something for nothing. That's what the OWS movement is all about. It's poisonous. I've read three of your so called "debunkings". You sound more like a slimy politician than anything else. "Everything you just stated goes against "True freedom is one that does not infringe the freedom of others." No it doesn't. Only in a classless society will everybody be in control of their own lives. "None of your views have ever stood the test of time." "If people aren't allowed to own their own property and labor (in other words they're slaves to your image of community)"
I'm all for having the right to have personal belongings. What I'm against is private ownership on the means of production. The people must be in control of production, not the non-elected financial elite. Owning your own labor? First of all, like I said in the article I linked to we recieve much more from society than we contribute (labor, taxes etc). But I'm very for people controlling their own work. The way I see it democratization of workplaces is one of the most important factors in creating a free society. You don't own your own labor in capitalism; you're forced to sell it and take orders from the ones who own the resourses. "Free people are not going to buckle to your view of a utopia (iron-fisted top-down authoritarian redistribution by central planning)." "Capitalism has created higher standards of living and a freer happier people than socialism, crony-capitalism or statism ever could." I'm not sure if I understand what you mean. "Crony-Capitalism" has existed for a very long time. Which type of "capitalism" (that has created the higher standards of living) are you referring to? It is not x profitting on y's work that creates wealth and technology; that's done by human hands and brains. "Yes, we live in a free ride society. I'm advocating for that to stop"
Really? You don't want to take part in and enoy all the technology and wealth that has been created thru the years? Didn't you read the article? "and it starts right at all the OWS complainers who expect something for nothing." "I've read three of your so called "debunkings". You sound more like a slimy politician than anything else." How so? So you wern't able to come up with one single counter argument? True freedom is no taxes. No, why would you say that? If you are talking about Laissez-faire Capitalism then that's just private tyranny. Oh, I'm sorry. I have other priorities than reading a 200 page ultra right-wing book. Since you posted the comment here, you must have some objections to what I wrote in the post, right? So, what are they? The problem is you need to sit down and read 200 page works on these types of things to get a good understanding of both sides and deduce a logical remedy for our problems from that....instead of assuming you're correct and not touching anything anyone provides that might conflict with your view. I understand the draw to your argument. It makes good intuitive sense...you want to help people...i get that....so do i....and not the rich...but the poor. But what if the things you suggest increase the very thing you want to do away with? "The problem is you need to sit down and read 200 page works on these types of things to get a good understanding of both sides and deduce a logical remedy for our problems from that"
Is this something you have done? Tell me, how much Rocker and Kropotkin have you been reading lately...? "But what if the things you suggest increase the very thing you want to do away with?" It doesn't. The things I suggest will decrease, in fact eventually eliminate the things I want to do away with, like tyranny and plutocracy. Are you still embracing this libertarian ideology? Haven't you realized that these ideas are just a call for a corporate-run society? I've definitely explored your side of the argument. I'm going through Naomi Klein's the shock doctrine right now, read several of chomsky's works (who i like and respect, but disagree on a number of things), Krugman, Maddow, Marx, Keynes, kevin phillips and others. "The things I suggest will decrease, in fact eventually eliminate the things I want to do away with, like tyranny and plutocracy. " Says who? What evidence suggests this to you? Should i take your word for it? I definitely embrace portions of the libertarian philosophy. Until humans change their whole mindset as a race, in my opinion it is the best system out there to create the most prosperity for the maximum amount of people. I advocate Libertarian Socialism. LS is about dismantling illegitime hierarchies and creating a free, egalitarian society. Libertarianism is awful because it leads to a society in which people don't get to control their lives, but instead must obey the rulers - the corporations. "Libertarianism is awful because it leads to a society in which people don't get to control their lives, but instead must obey the rulers - the corporations." couldn't be further from the truth. Libertarian society is about individual liberty and having complete control over your life...the's the whole basis of it. What control does a corporation have over you in a libertarian society? How do they rule you? I know you advocated libertarian socialism...i've read your posts and watched your videos. "couldn't be further from the truth." "Libertarian society is about individual liberty and having complete control over your life"
This is false. Right wing Libertarian philosophy is a call for corporate tyranny. "What control does a corporation have over you in a libertarian society? How do they rule you?" In a non-regulated capitalist society (like all others) the more resources and wealth you have, the more power you have. So in this kind of society it is the big corporations and the financial elite who overwhelmingly are in charge of the economy and market (very similar to today's actual society). They control the resources, the economic institutions, and the means of production. In other words: They have an overwhelming power over the economy and the marked as a whole. Not only do the rich and powerful (in an undemocratic way) control the economy as a whole in huge networks of transactions, investments and stock exchange, they also rule the institutions in this kind of society in a totalitarian way. The economic institutions in a capitalist society have a totalitarian model: a tyrannical non-democratic hierarchy in which the people at the top - the CEOs, owners etc - dictate how the institution is being run, what’s being produced, working conditions and so on, while people further down the hierarchy must follow their orders - a non-democratic hierarchy with control and power in the hands of the ones at the top. Capitalist institutions are in other words private tyrannies. In Ron Paul's dystopia it's the corporations that run society, not the people. I think your problem is you're taking our society and assuming that it is a libertarian society. Nope. What I described above (to which you didn't present any counter-arguments) was the right-wing libertarian, so-called "free market" capitalism. "This is false. Right wing Libertarian philosophy is a call for corporate tyranny." Says who...where is your proof or data to back this claim up? "In a non-regulated capitalist society (like all others) the more resources and wealth you have, the more power you have. So in this kind of society it is the big corporations and the financial elite who overwhelmingly are in charge of the economy and market (very similar to today's actual society). " Says who? Where's your proof of this? Where have you seen a libertarian society turn into something like this? Examples?? I realize its intuitive to assume these things and it makes sense in your head when you sit around and think about it....but like most things in economics it's counter-intuitive. You said "Which you didn't present any counter arguments". But my problem with your arguments is they're opinion based. You never present data, facts, or resources to back up what you're saying." This is how YOU present right wing libertarianism. If you don't think my assumptions of how awful your libertarian society would be are good enough, why should anyone believe the assumptions you present as to how great it would be? We have seen the results of a very close to laissez-faire society in the past. "Lets take an example of the stuff you posted above: This is false. Right wing Libertarian philosophy is a call for corporate tyranny. Says who...where is your proof or data to back this claim up?" I explained why it would be that way. We have seen the results of a very close to laissez faire society in the past, with inhumane results and private tyranny (beginnings of the Ind.Revolution fex). What I explained above is true and logical, and you haven't presented any counter argumnets as to why Im wrong. So where was I wrong then? Present some arguments. "We have seen the results of a very close to laissez-faire society in the past." Industrial revolution was not a libertarian society. But since we're on the topic...what specific private tyranny during this period are you referring to? Which corps took advantage etc? This graph looks the same every year....direct correlation with income and freedom. You can take a country like hong kong (one of the poorest in the world a few decades ago)....and turn it into one of the most prosperous all in the span of a couple decades.....and even hong kong we wouldn't consider a libertarian society...but it was ranked (in the last decade or so they've gone the other direction) one of the freest countries in the world economically speaking....and business absolutely exploded. "The freedom objectives are based around how free market the society is how little intervention there is in the system by government. " Once again, I don't accept the premise. The "free market" is not free in any meaningful way. A free market in your sense is tyranny. "You're picking the countries based on how well the people are doing"
No, we must pick the good ideas of a real participatory democracy and freedom, and implement them in society. "You keep saying that...but you don't provide a shred of evidence besides your opinion of why your statement is true." I've answered this earlier. This is how YOU present right wing libertarianism. If you don't think my assumptions of how awful your libertarian society would be are good enough, why should anyone believe the assumptions you present as to how great it would be? We have seen the results of a very close to laissez-faire society in the past. "So you sit here arguing with me back and forth about the fact that these huge companies will take over everything but you won't provide 1 single example???" Are you denying that there were huge companies back then? If not, why is this relevant for the original point? "i think pure democracy can turn into a complete disaster." "Slavery was legalized through this mindset...a majortity of the people"
There wasn't democracy under slavery. It must be the people that should get to decide what kind of laws they should have. In some cases the majority agrees with you, in others they don't. That's how its got to be, and it's a logical consequence of living in a society. I am aware that unjust laws have been implemented thru democracy, but the alternative to democracy is minority rule and dicatorship. And the society I want is a democracy controlled from below, problems like that would be down to the minimum. "I want my rights based as an individual"
I strongly favor individual rights. But it must be the people who should get to decide what these rights are going to be. "Oh, I can provide examples (which can easily be found) . But you didn't answer my question: Are you denying that there were huge companies back then? If not, why is this relevant for the original point?" So provide some examples of what you're talking about!! You just did it again! - - - "We have seen the results of a very close to laissez-faire society in the past." Provide an example of what you're talking about! The industrial revolution? What companies? Who took advantage etc? You need to back up what you're saying. I'm not denying there were big companies back then at all. "There wasn't democracy under slavery." It was group think mentality....the masses thought it was ok to enslave people...this wouldn't have happened under a libertarian society, it's impossible. Could it happen in a purely democratic society? You bet...if 51% of the people thought it should be done. There you go with BS about a "free market" again. Depends what your definition of free market is. "I'm not denying there were big companies back then at all." So why do you have to hear it from me? How is this relevant? "So provide some examples of what you're talking about!!" "By the 1890s, industrialisation in these areas had created the first giant industrial corporations with burgeoning global interests, as companies like U.S. Steel, General Electric, Standard Oil and Bayer AG joined the railroad companies on the world's stock markets"
"It was group think mentality....the masses thought it was ok to enslave people"
Well, I want a civilized democracy controlled from below. If you want to criticize the slavery and an immoral group of people supressing blacks, then that's good, but don't bring this up here, because it has absolutely nothing to do with the society I want. "this wouldn't have happened under a libertarian society"
Not slavery, but a lot of discrimination and supressing of rights and freedoms that blacks have today could become reality. "Could it happen in a purely democratic society?" Nope. In a Libertarian Socialist society this would not happen. "The ten objectives taken into account to determine how free the country was are: property rights, freedom from corruption, fiscal freedom, government spending, business freedom, labor freedom, monetary freedom,trade freedom, investment freedom, financial freedom"
There are different kinds of freedoms and different understandings on what real freedom is. Again, I don't accept the premise. "You can't cherry pick like that...that's not how statistics works." I wasn't talking statistics, I was just informing that there has been economic growth in many different kinds of systems - which kind of undermines your point a little. I am fully aware that there has been economic growth in many semi-capitalist systems, but it's not x's profit on y that leads to growth. There are also more important factors to take into account when organizing a society. "Would you base your economy on an example of one other economy....or 500 other economies?" What we must do is to create a sustainable, free, democratic, and just society, where decitions over production is made by the people participating. Not if these conduct unjust and immoral policies. "You can see it on any graph that the rich are getting richer and the poor are getting poorer." "The problem is you and i differ in what the root cause is. You blame the rich..."
No, I blame the system. "i blame the monetary system and government/corporate hybrid." The current system is of course to blame for the current situation, the problem is that your ideas would just make society even worse than today. I think it boils down to the fact that you think it's ok that we should have a system that allows people who are not democratically elected to have power and control over others. I don't think that's ok. I think people should have a say in the things thery're apart of and affected by, and that we therefore must democratize institutions and communities etc. "Can't you provide examples of what you're talking about? You talking about the railroads? Standard oil? What exactly? This is important...this monopolistic viewpoint." Are you denying that there were huge companies back then? If not, why is this relevant for the original point. "There are different kinds of freedoms and different understandings on what real freedom is. Again, I don't accept the premise." The freedom objectives are based around how free market the society is....how little intervention there is in the system by government. The criteria outlined is about as close to a definition of free market as you can get. "Not if these conduct unjust and immoral policies." You're picking the countries based on how well the people are doing...if there are unjust and immoral practices i'm pretty sure the people wouldn't be doing that well. "the problem is that your ideas would just make society even worse than today." You keep saying that...but you don't provide a shred of evidence besides your opinion of why your statement is true. "Are you denying that there were huge companies back then? If so, why is this relevant for the original point." So you sit here arguing with me back and forth about the fact that these huge companies will take over everything but you won't provide 1 single example??? I don't understand this....if this happened back in the industrial revolution to ridiculous degrees why can't you name 1 incident/example? That's not very hard to do I wouldn't think. Give me something here to back up your claims besides your opinion on the matter..
"I think it boils down to the fact that you think it's ok that we should have a system that allows people who are not democratically elected to have power and control over others." You and i have talked about this...i think pure democracy can turn into a complete disaster. Slavery was legalized through this mindset...a majortity of the people thought it was ok to strip the rights of people. Salem witch trials...nazi's. Group think i find to be incredibly dangerous. I want my rights based as an individual...not because some group forces them on me. What if the majority of the people at your work place thought that you should be forced to make monthly donations to fracking? "Industrial revolution was not a libertarian society"
I said there were systems very close to it. "But since we're on the topic...what specific private tyranny during this period are you referring to?" Why do you want to know that from me? Can't you find this info easily if you want to? ...or are you denying that there were huge powerful businesses back then..? 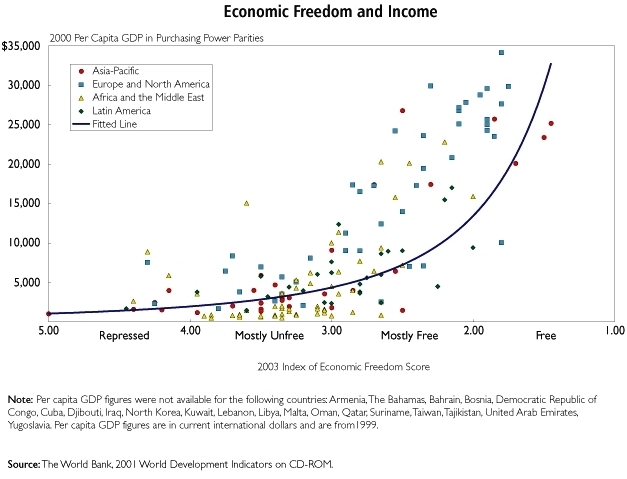 "How about the fact that when you chart economic freedom (free market) vs gdp, income per capita, employment and on and on the correlation is always in my favor. Here's an example that"
Oh, you mean a chart on societies with crony capitalism? Tell me, are the enormous state subsidies, bailouts etc etc included in this research? And I don't accept the premise. "Free" or "mostly free" as it says is not free in any meaningful way. As I said in the post, freedom for private enterprise is not real freedom. And do you have a similar chart showing how the wealth gap and concentration of private power (which you seem to deny will be an important factor in your libertarianism) are distributed...? You didn't show any of that. Now why is that..? There can be economic growth in any kind of system. There was huge growth under Stalin f.ex. There are lots of factors thatcan be involved. It is not the x profitting on y (like it is in the capitalist system) that creates wealth, thats done by the people working. I don't get you, John. RP isnt going to redistribute wealth before giving people huge tax cuts, right? How can you not admit that the wealthy (who'll get the overwhelming amount of cash) will become much more wealthy and powerful..? It's based on a scale of 0-100..with 100 being the most free. The graph is simplified on the x-axis to make it easier for people to understand...it's actually graphed based on the 0-100 scale and the overlayed with the 0-5 thing you see. So yes, the enormous subsidies would be included in the report of freedom indexes. "There was huge growth under Stalin"
You can't cherry pick like that...that's not how statistics works. What you want is to find the best possible type of economy that has the best possibility to provide for the most amount of the people based on the statistics. Would you base your economy on an example of one other economy....or 500 other economies? Obviously 500...you want to look at the data as a whole and give your people the best shot with what the data is telling you. "RP isn't going to redistribute wealth before giving people huge tax cuts, right?" The problem is you and i differ in what the root cause is. You blame the rich....i blame the monetary system and government/corporate hybrid. I do believe under a sound monetary system and lack of government/corporate hybrid that this graph would turn around like it has in the past. "Can't you find this info easily if you want to?" Can't you provide examples of what you're talking about? You talking about the railroads? Standard oil? What exactly? This is important...this monopolistic viewpoint. Libe(R)tarianism about letting folks like the Kochs run your life and your country too!!! Everything else about it, is made up by those same people to convince you, you have a "choice". They have no control over your life or your country...at all. How does a wealthy corporation control you in a lib society...you still can't answer that for me. Ignorance is bliss, is the philosophy necessary for you to believe that. Even if you buy another manufacturers toilet paper, that's still control wielded by the Kochs.. The Kochs and their WallStreet cohorts still control how much you will pay for that product. If you think dumping $100,000,000s into the political process? That it has NO effect? What does that say about the thought process needed to make that conclusion? What boggles my mind is you guys will talk like this....but then you talk about government run healthcare for everyone. Talk about a monopoly on health care. Talk about money influencing the type of treatments you'll recieve...talk about taking the power of the decision making out of the patients hands and handing it to some bureaucrat who's pockets are lined by the very companies that are making the drugs/treatments for you....talk about research money being funded towards things that make money....and not towards cures for people....talk about cutting out competition in alternative medicine that might hold more promise, be cheaper, and possibly more effective. This is what happens with stuff liek this....you create the monster you're trying to stop. Then you'll sit there and say "this will never happen"....this does happen..and already does with the machine in washington. Take the guy who found a cure for cancer that workds better than chemo in most instances....void of side effects...attacked and demonized for decades for his life saving discovery....government attempted to throw him in jail...while at the same time filing a patent on his discovery. This isn't isolated..this happens all the time. This is why people like me are completely against government healthcare...not because we're evil and want the elite to rule and all the poor to die....the exact opposite. On the health care issue, I've been trying to get you to read this guy, instead of the constant "right" wing propaganda. Leave the knee jerk stuff at home. You completely ignored the Kochs. Do you also ignore the effect of folks like Limbaugh? "The Kochs and their WallStreet cohorts still control how much you will pay for that product. If you think dumping $100,000,000s into the political process? That has NO effect?" Hell yeah it does have an effect. So what? What does that have to do with my argument? You're arguing along the same lines as struggleforfreedom....assuming that this society we are in today is what I am arguing for and you can take little bits of it (the kochs) and bring up the corruption of today and that somehow translates to what i'm arguing for. It's like not building the foundation for the house right and then throwing extra weight on the roof....of course its going to come tumbling down. You can't take little pieces of what i'm suggesting and try to toss it into our society...or think about it in our societies terms...this soceity has no semblance for what i'm arguing for. I'll read your book....after i get through the shock doctrine. "The effects of the folks like Limbaugh?" What effects? The fact that he's a douche and spews lies all day long? You're basing your whole medical care argument on a 2hr youtube video? Then you offer a "so what" comment on the Kochs? You still have a long, long awy to go. I'm basing it on spending the last 5 years immersed in it because of a very sick family member. "so what" on the kochs....because it doesn't have anything to do with what i'm talking about...if you could read english you'd already know that from my comment above. Pumping millions into the political system in our society makes a huge freaking difference...that doesn't have anytihng to do with what i'm suggesting. You're taking part of an idea....and forgetting the entire foundation. "You're basing your whole medical care argument on a 2hr youtube video?" You're basing your entire argument on the koch brothers??? "but then you talk about government run healthcare for everyone. Talk about a monopoly on health care"
The government can at least be run democratically. A capitalist society is run by the non-elected financial elite. If you think people should have a right to control their own lives - a say in the things that affect them, you should reject this awful ideology you advocate, and embrace ideas that will increase democracy. How do the elite rule you? Through government. What does a libertarian society say about the role of government in society? "How do the elite rule you?" The problem is you're wrong...this doesn't happen in society. The evil businesses that spring up and control huge portions of the economy WITHOUT the help or incentive from government. Economists have studied this very thing....it doesn't exist.